1. 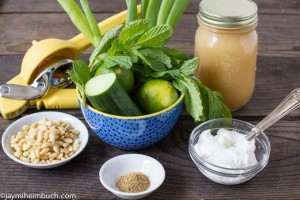 Trim the ends off the cucumbers and peel them. Slice them lengthwise then use a spoon to scoop the seeds out. Slice them into thin half-moons, and combine them with the sliced scallions into a mixing bowl. 2. 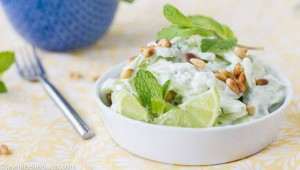 In a small bowl, combine the yogurt, mint, lime zest, lime juice, honey, coriander and salt. Whisk until thoroughly mixed. Pour over the cucumber mix and stir to combine. 3. Spoon into bowls, and garnish with mint leaves and pine nuts. Enjoy!